Angel Books, CDs and gifts. There is a growing awareness of the angelic kingdom and increasing interest in sensing and working with angels in daily life. The books featured on this page and the following pages include a wealth of material, stories, advice and inspiration. Also included are various "Angel Cards". 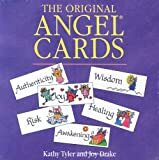 We appreciate angel books, cards, and inspiration and have found that each author has a slightly different emphasis. One well-known writer on this subject is Doreen Virtue (Angel Visions, The Crystal Children, Angels 101 and many more). See also Spirit Guides and Angel Guardians by Richard Webster.